Last week, Mayor Rahm Emanuel broke ground on a major project to transform the riverfront neighborhood on Chicago’s North Side into one of the City’s largest recreational hubs that provides residents with an unobstructed network of parks and recreational amenities. The 312 RiverRun will connect the surrounding Irving Park, North Center, Avondale and Albany Park neighborhoods to three parks with one path for nearly two consecutive miles. Once completed, 312 RiverRun will connect Horner Park to the north to California and Clark Parks to the south. It will extend across 95 acres with facilities and programming for every athletic activity supported by the Chicago Park District including: softball fields, wheelchair accessible baseball fields, fitness centers, playgrounds, an indoor ice skating rink, tennis courts, the mountain bike/Bmx trail, an outdoor pool, boat houses and more. The project kicked off Oct. 4 with the groundbreaking of the Riverview Bridge, which will cross over the North Branch of the Chicago River and under the Addison road bridge. The new bridge will provide a new connection for runners, bicyclists and pedestrians between the paths in Clark Park to the south and California Park to the north. Reaching more than 1,000 feet long and 16 feet wide, the new Riverview Bridge will be the longest pedestrian river bridge in the city. It will have an elevation of more than 18 feet to accommodate recreational use by boaters. Its unobstructed access will also eliminate the need for residents to cross major streets, enhancing pedestrian safety. 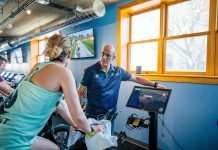 “We are excited to be starting work on this transformative project that represents a major piece of Mayor Emanuel’s plans to create new recreational opportunities for Chicago’s neighborhoods,” Chicago Department of Transportation Commissioner (CDOT) Rebekah Scheinfeld said. The Riverview Bridge is anticipated to be complete by the end of 2018. A second CDOT project, the Irving Park Road Bridge and Multi-Use Path, due to begin construction next year and to be completed in late 2019, will extend a pedestrian and bike path under Irving Park Road and link California Park to Horner Park north. Work on the Irving Park Road Bridge will also replace the existing 95-year-old structure to widen the roadway. 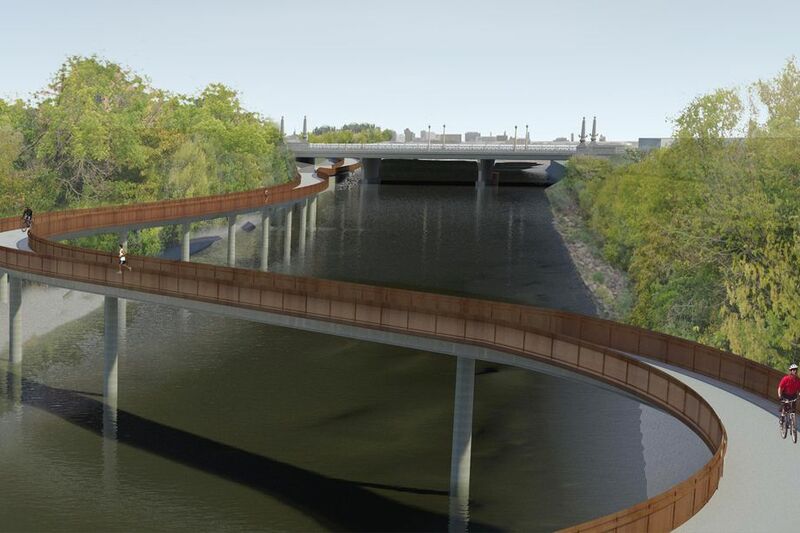 Completion of the Riverview Bridge and the Irving Park Road Bridge project will establish the full 312 RiverRun, providing a continuous path from Belmont to Montrose. The 312 RiverRun redevelopment project is a collaboration between the Chicago Departments of Transportation, Planning & Development and the Chicago Park District and continues Mayor Emanuel’s goal of developing a continuous river trail system. The project is supported by numerous federal, state and local agencies, with funding provided by the Federal Highway Administration, the Illinois Department of Transportation, the Chicago Metropolitan Agency for Planning and local sources. Other agencies involved included the U.S. Army Corps of Engineers, the U.S. Coast Guard, the Illinois EPA and the Illinois Department of Natural Resources. In addition, it required an agreement between CDOT and the Metropolitan Water Reclamation District of Greater Chicago (MWRD) to lease four parcels of land along the North Branch. The Riverview Bridge design team was led by Epstein, a Chicago engineering firm that has designed the redevelopment of Midway Airport, as well as the south and west expansions of McCormick Place Convention Center. The project will be constructed by Illinois Constructors Corp. The 312 RiverRun project is a key component of Building on Burnham, Mayor Emanuel’s comprehensive plan to invest in the Lakefront, the Chicago River, natural areas and recreational opportunities in neighborhoods across the city. This plan follows the Mayor’s successful expansion of Chicago’s park system in his first mayoral term, which has already added 750 acres of new parkland, 327 new playgrounds and more than $800 million in capital investment from neighborhoods and private sources.